My thoughts: First, the disclaimer. "I was provided a free copy of this book. All opinions are my own." 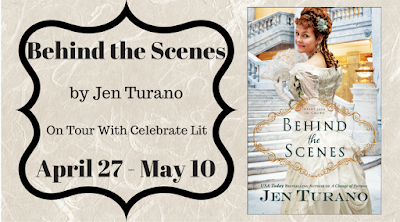 That done, BEHIND THE SCENES is a really cute, humorous historical set in New York about a rich socialite who is a confirmed wallflower. Most of the characters have really odd names, I didn't take the time to look them up to see if they are legit or not. I did recognize some names as being prominent back then. The language is quite formal, but probably the way the rich and famous talked back then. It was rather jarring and made me focus on words instead of story. I enjoyed getting to know Asher and Permilia. 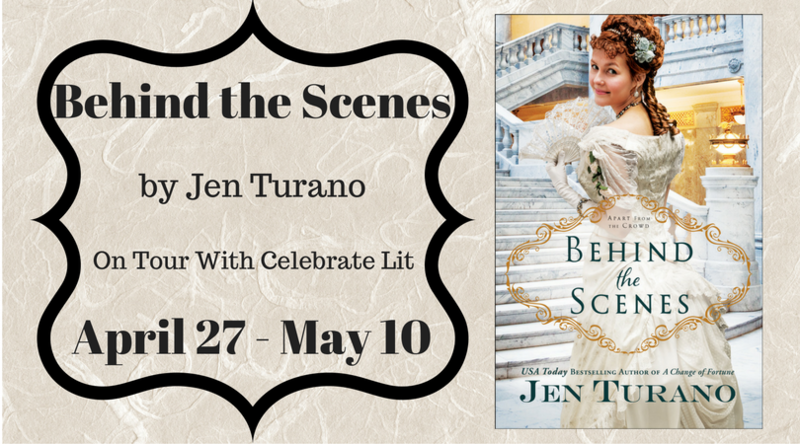 Permilia lacked all kinds of social graces and didn't know how to act around people, with even pleasantries. It was laugh out loud funny at times. And Asher, of course, was sweet. So you may be wondering what classic movie Alice’s Notions reminds me of. Charade with Cary Grant and Audrey Hepburn was released in 1963. In that movie, Hepburn is being pursued and doesn’t know who she can trust. The movie has light hearted intrigue, suspense, and romance just like Alice’s Notions. 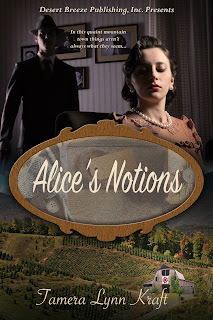 Alice is also in the middle of intrigue she doesn’t understand and doesn’t know who she can trust. My thoughts: First, the disclaimer. "I bought a copy of this book. All opinions are my own." 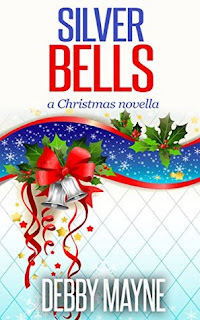 That done, SILVER BELLS is a cute story about an older couple. Alex has been a part of her life forever, her husband's best friend, and he took care of her since Paul died. Now he's ready to move on, but it seems Carol is still grieving, five years later. All in all a cute novella, easily read in a few hours. And even though it's spring when I read this, its never too late (or too early) for Christmas stories. There is a weak faith message included. Love in Store Majolica by Anita Mae Draper and #giveaway! Thank you for hosting me, Laura. It's a pleasure to be here. 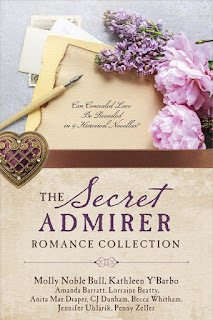 Giveaway: Anita is giving away a print copy of The SECRET ADMIRER Romance Collection in conjunction with this post. 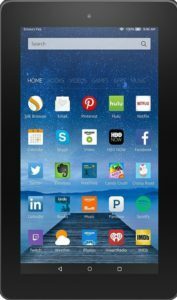 If you want a chance to win it, leave a comment before Sunday midnight April 30. Looking through old catalogues gives a true sense of what was available to the staunch people who settled the west. So when I needed authentic items for the 1890 store in my new novella, Love in Store, I researched china and pottery items for the last couple decades of the 19th century. 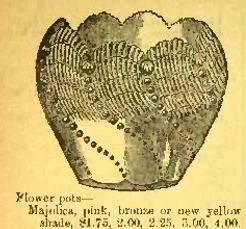 Catalogue references to majolica ware for pitchers, vases, and flower pots made it sound like a common item, yet I'd never heard of it, so that's where my research began. When I found the following example in an 1894 catalogue, I knew majolica was pretty enough to be featured in my hero's Emporium. What is majolica? 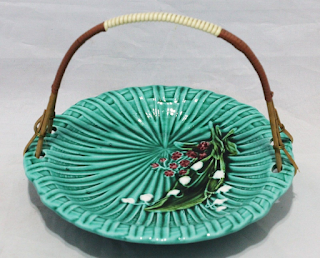 The simplest explanation is that majolica is an earthenware item covered with a lead- or tin-based glaze before painting. This surface allows for a brilliant white, opaque surface which, when painted, gives it lustrous qualities. Once I saw a few examples, I was able to pick majolica out of a group of pottery, although I won't hazard a guess whether I was looking at an authentic piece or a reproduction. On the heels of my majolica research, I was searching through a stack of dishes at my local recycle aka second hand store and found an incredible dish with Lily of the Valley flowers in a textured bowl. Although I hadn't seen the pattern before, I quivered at the thought that it might be majolica. Flipping it over didn't quell my rising excitement when I didn't see majolika, but the fact that it was made in Germany gave an indication that it was probably a current reproduction. 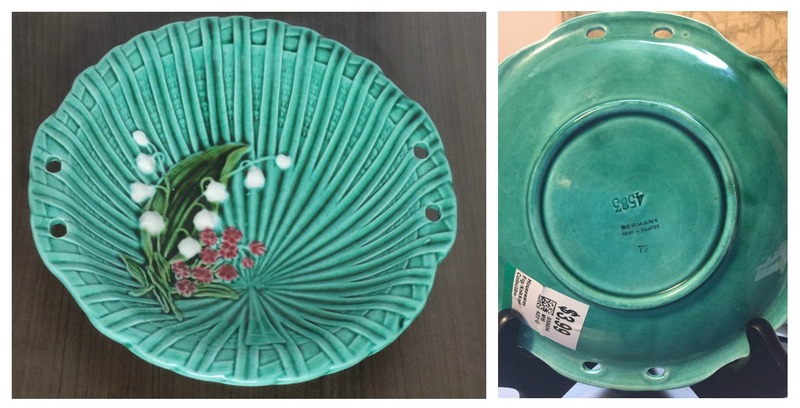 Further research confirmed the bowl as being a reproduction of the Palm Leaf and Lily of the Valley pattern originally made in the Villeroy & Boch factory in Schramberg, Germany. It took another search to find an image showing the holes fitted with a carrying handle. Finding majolica at the same time I was writing about it was one of those blessings that feel like God's pat on the back. It also brought Adam's Emporium to life. 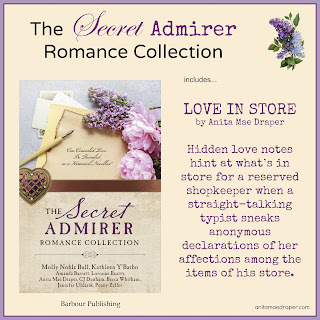 I created my Love in Store Pinterest board to show the inspiration behind the story. It fueled my imagination as I wrote the novella, and now I hope it brings Adam and Janet's story to life for you as well. 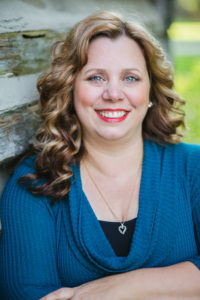 Anita's books are available wherever Christian books and ebooks are sold including Amazon.com. 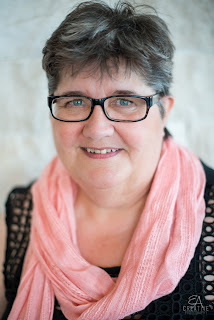 Anita Mae Draper writes her historical romances under the western skies of the Saskatchewan prairie where her love of research and genealogy yield fascinating truths that layer her stories with rich historical details. 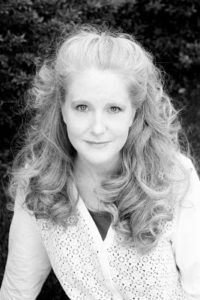 Her Christian faith is reflected in her stories of forgiveness and redemption as her characters struggle to find their way to that place we call home. 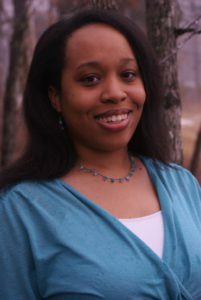 Anita loves to correspond with her readers through any of the social media links found at www.anitamaedraper.com. 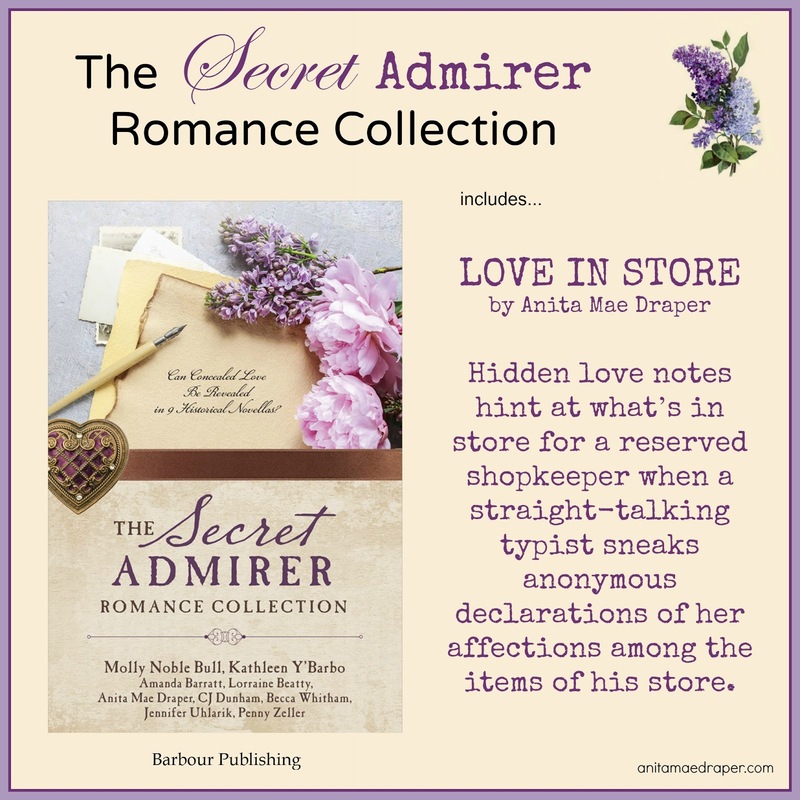 Readers can enrich their reading experience by checking out Anita's Pinterest boards for a visual idea of her published stories at www.pinterest.com/anitamaedraper. A disgraced scholar running from her past and an entrepreneur chasing his future find themselves thrown together--and fall in love--on a Tolkien tour of New Zealand. Jackson Gregory was on the cusp of making it big. Then suddenly his girlfriend left him--for his biggest business competitor--and took his most guarded commercial secrets with her. To make matters worse, the Iowa farm that has been in his family for generations is facing foreclosure. Determined to save his parents from financial ruin, he'll do whatever it takes to convince his wealthy great-uncle to invest in his next scheme, which means accompanying him to the bottom of the world to spend three weeks pretending to be a die-hard Lord of the Rings fan, even though he knows nothing about the stories. The one thing that stands between him and his goal is a know-it-all tour guide who can't stand him and pegged him as a fake the moment he walked off the plane. 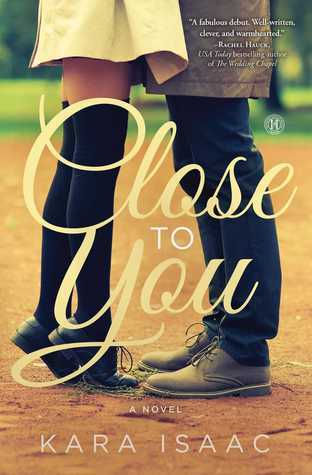 CLOSE TO YOU is a very good book. If you are a dedicated Lord Of The Rings fan, then it is guaranteed to drive you nuts how much the hero doesn't know. He is floundering through it because all he wants is his great-uncle's money. The tour guide was being driven nuts as soon she picked him up at the airport, because she was dressed up as a Hobbit and Jackson didn't know what she was supposed to be dressed up as. All he knew is that she wore padding, an ugly dress and a frizzy wig and that is all he knew about it. When he encountered a gollum/smeagol statue, he was thrown for a loop and had to look it up in a "cheater book". Allison is a dedicated Lord of the Rings fan and she knows more than I know about it. And she's always verbally slapping Jackson upside the head. 5 stars. I loved this book to death, I loved it. (Mom stepping back in here) If you are a Lord of the Rings fan, you will adore this book. If you are joining me in the "haven't got a clue" category, then maybe not so much. Awarding this book the stars my daughter assigned. My thoughts: A Proxy Wedding was the first book I've read by Toni Shiloh. It was a unique premise - I never read a story with a proxy wedding before. It was weird, but a very sweet romance as two strangers--complete opposites--were forced together for a week, even standing side by side as a judge pronounced them man and wife (in their friends' names, of course.) And what better than a wedding to make you think romance? The black moment seemed a little off. Carly completely changed personality there. So did Damien for that matter. 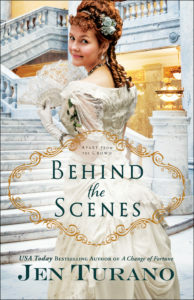 My thoughts: Hope Beyond Savannah is also the first book I've read by Melissa Wardwell. This one a bit more difficult to read than Toni's, as I was in Lily's position where I was the girl my then boyfriend wanted to marry and his mom treated me every bit as badly as Nik's mother treated Lily. I do admire Nik for standing up for Lily. This story was very well written, Ms. Wardell is a talented author and I loved the way she wove it together so seamlessly. And despite the rocky, depressing situation Nik and Lily found themselves in, it worked out beautifully. My thoughts: First, the disclaimer. "I was provided a free copy of this book. All opinions are my own." 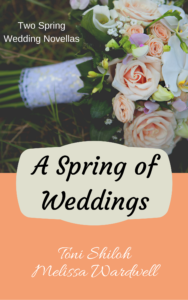 That done, A SPRING OF WEDDINGS contained two stories by two new-to-me authors. 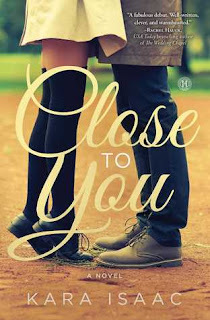 I enjoy reading contemporary romances, and these were sweet. They are both clearly Christian, but gentle with the faith message. If you like contemporary romances, you will want to read this collection. Interview with Mary Davis and #giveaway!! !